Kataragama steadily becoming a purely Buddhist place of worship? Sri Lanka's Most Holy Hindu Site becoming a Purely Buddhist Place of Worship? In 1966 the German scholar Paul Wirz observed in his book Kataragama, the Holiest Place in Ceylon, "One could say that all religions are represented in Kataragama and that all are getting on well with each other. All ritual differences seem to be resolved out here; all are reconciled with each other and even the feeling of caste is completely forgotten." Twenty year later, rancour has replaced reconciliation at Sri Lanka's southernmost shrine. In recent years, however, religious, social, cultural and economic changes have left this hidden Muruga sanctuary all but a Buddhist citadel. Few traces of the Hindu share to Kataragama remain. On a July visit to attend the Muruga festival and investigate claims of a Buddhist takeover, Hinduism Today found the sanctuary almost beyond recognition from earlier times. In each of its main sections - Kataragama the Sacred Area, Sellakataragamam and Kataragamalai (the most important sacred peak) - one now sees Buddhist shrines, houses, shops and other business concerns. And not a single bo-tree, not a Hindu temple under Buddhist control is spared the ubiquitous Buddhist flag. The move on Kataragama began shortly after Sri Lanka's independence in 1948, even before Mr. Wirz wrote his book. Sinhalese Buddhist politicians who dominated the country's legislative, aggressively maneuvered to transform it to a prominent place of Buddhist worship. After making the village motorable in 1950, Sinhalese were encouraged to settle there. Previously, pilgrimage was on foot through dense jungle tracks. 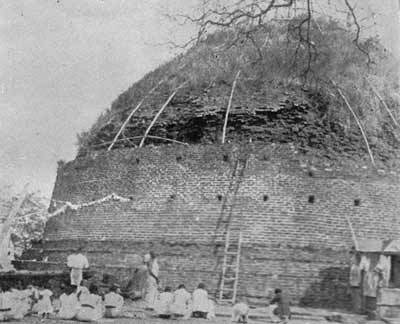 The place covering the main Murugan Temple and the ruined Kiri Vihare was declared "Kataragama Sacred Area." Introducing the Development Scheme, the outskirts of the Murugan Temple were given a Buddhist outlook by demolishing all the 21 Hindu pilgrim abodes - like the 150-year old Chetty Madam - and shrines attached to each of them, like the Multumani Amman Temple. This included removing shops crammed with puja offerings, rudraksha malas and vegetarian food and other Hindu business establishments such as barber stalls for pilgrims taking vows. Kiri Vihare ('Sooran Kottai') as it looked in the 1950's. Under the same scheme, Kiri Vihare, about one third of a mile from the Murugan temple, was renovated and its environs, including lands formerly used by Hindus, were developed to facilitate Buddhist worship. In this way, the Hindus have been suppressed and their power and influence in the area reduced. On the land were demolition was effected, four new shrines, built according to Buddhist architecture, have come up. Says the manager of one of them, Murugesapillai Rengaraj of Bandarawela, "I was permitted to build the Vinayagar shrine on the small plot allotted to me on condition that I should not alter the given building plan." The planter said further, "To preserve our cherished Hindu culture, at least in a small way, I got the beautifully carved door and door frame of our Old Arunsalam Madam fitted to the shrine." The Ramakrishna Mission Madam was taken over in 1960 by the Sirimavo Bandaranaike government, given to be used as bhikkus' quarters. More recently it has become a Buddhist Archaeological Museum, with a statue of Buddha at its entrance. On the loss of the Mission's great services to pilgrims, V.R. Pasupati, 56, a school principal from Kottagala, lamented: "Hindus miss the Thiruvasagam relayed through the loudspeaker at Brahma-Muhurtam to awaken them to get ready to go to the Temple." Now pirith recital and bana preaching of the Buddhists fill the air everywhere. "Kavadi dance has become baila dance," observed Nagaratnam Sivakumaran, a 38-year old technical officer from Wellawatte. "In the past, it threw a bewitching spell of bhakti on on-lookers. But today the Western band music and the Sinhalese drumming provided for it gives a pep for pop music." Puja offerings kept in an 'archanai thattu' for sale are similar to those at Buddhist temples. Paper garlands are kept instead of fresh flowers. The Hindu holy ash, kumkum, sandalwood paste and lime are not to be found. "Since there are no Hindu shops in Kataragama, what is available is offered," says a housewife from Point Pedro, S. Vijayalakshmy, 32 years. Those interested in projecting Kataragama as a Buddhist centre have capitalised on the colorful festival procession by introducing Buddhist features into it. On the day before the water-cutting ceremony, Lord Murugan goes to Sooran Kottai (Kiri Vihare to the Buddhists), the fortress of the Asura, to meet the mother of Soora Padman whom He vanquished in the Sooran Por. Now, a 'relic' is taken ceremoniously from the Buddhist temple (formerly Perumal Hindu Temple) in the inner courtyard of the Murugan Temple, placed on a caparisoned elephant and made to lead the procession. On witnessing this, Theedchanamurthi Elayatamby, 70, a retired teacher from Tirunelvely commented, "Lord Murugan is God and Gautama Buddha a great Hindu saint. How can man lead God?" With Buddhist monks, banners and torchbearers in the procession (in which there is a well-organised Buddhist cultural display of Kandyan dance of various forms) and the voice of 'Sadhu, Sadhu' reverberating from the vast Buddhist crowd - any foreign tourist or television viewer would feel that a Buddhist pageant is in progress! The shortage of both local Hindus and Hindu pilgrims has adversely affected regular features of the festivals. This July, the absence of the traditional Aum Vadivela Varuga canopy held over Lord Murugan in the procession was conspicuous. It is normally carried by 12 of the pilgrims who walk long distances from the North and the East, covering more than 300 miles. Also absent were the groups of Hindu devotees who go dancing and singing the praises of Lord Murugan. A few elders who braved dangers to be present for the festival sang bhajans. The Ananda Nama Bhajan - chanting Aum Muruga mantra at the Palani Andavar Temple - could not be continued throughout the night. "One day I had to keep the bhajan going until Swami returned from his other festival duties and wound it up in the midnight," said Tiruchelvam who works at the Temple. An interested party forcibly took over the Kandasamy Temple at Katiramalai in June 1969. Prior to this, a Reverend Bhikku Siddhanta stayed there with the residing priest, Sankaraswamy, and learned Hindu mantras and puja practice from him. The bhikku demolished the Pillaiyar Temple at Pillaiyar Peak in 1970 and built a new shrine a few yards away from the old sacred spot. In 1971, the Theivanai Amman Devasthanam was looted and valuables taken. On September 26, 1979, the Manicka Pillaiyar Temple at Sella Kathirkamam was taken over under threat. As late as 5th December, 1985, unwanted elements intruded into the Theivanai Amman Devastanam and manhandled Swami Dattaramagiri Bawa, Nagalingam, a cashier in his seventies, and others who were there. When asked why he continues his stay there under dangerous circumstances, Swami replied calmly, "Why should I run away from here? Death comes once; let it come to me anywhere." "It is a self-evident truth that Hindu shrines ought to be managed by Hindu Priests and Swamis," noted one observer. Temples under non-Hindu control have begun shedding established Hindu principles and practices. While puja goes on for Manicka Pillayar at Sella Katargama, tickets are thrust on worshippers to collect money for a building fund. Sinhalese books are sold in a shed attached to the temple. SivaŚrī S. Sabesa Kurukkal, 36, who officiated there in 1979 and 1980, told Hinduism Today, "When I found I could not maintain our ancient Saiva practice, I left the place." Now two Sinhalese youths are learning Tamil and receiving training in puja practice. "What's the next step?" local Hindus wonder. In the past, the victory Vel of Murugan on a rock atop Katira Malai (hill) was the only symbol of worship. Seeing young non-Hindus climbing this holy hill with their footwear on and carrying food baskets, P. Manickam, 70, a trader from Pettah, remarked, "It is not pilgrimage but hill climbing for some." But more than attitudes have changed. When a pilgrim took the old route (blocked now) before, he prayed at the Vairavar Rock at the foot of the hill and at the Pillaiyar Rock half way before reaching the summit. The new path leads through a huge Buddhist structure at the entrance where a sign says, "Kanda Kumara Yantra available for Rs. 50 Śrī Siddhanta Swami," catches the visitor's eye.  (Kanda Kumara refers to Lord Murugan in Sinhalese). Is this 'Śrī Siddhanta Swami' the same Reverend Bhikku Siddhanta who stayed with Sankaraswamy for some years? Shock and grief awaits the old pilgrim at the summit of Katira Malai. With tears in his eyes and voice quivering with emotion, Ponniah Karunaharan, a 71-year-old Saiva Siddhanta scholar from Keerimalai reveals, "The sacred Vel our Lord planted for His devotees to worship lies buried under a concrete Sivalingam!" And SivaŚrī Ananda Sarma, the officiating priest reacts to the revelation, "Hamudusee (a Buddhist monk) did it according to a divine order given in his dream." So, a new 'Sivan Temple' has come at the old sacred spot. New Buddhist structures, too, are found on the summit. Echoing the views of Hindus who watch helplessly the changes taking place to erase from memory Kataragama's identity with Hindu worship, Arunasalam Ramanathan, 38, a farmer from Nuwara Eliya noted wryly, "There is going to be another Buddhist centre in Sri Lanka in the name of Kataragama." Selvan Kalyanasunderam, a Colombo lawyer, warns, "So long as the Vel remains covered and Hindu shastras are violated, the country faces further destruction." Recurrent ethnic riots between Sri Lanka's Sinhalese Buddhist majority and Hindu Tamil minority which commenced in 1956 and exploded into the July 1983 holocaust have caused the prevailing turmoil in the country. The Tamils whose homeland is the North and the East are frightened to go to the South where Kataragama is situated. "How are we to go? Where are we to stay? Are we safe there?" are questions on the lips of Hindus. There are pilgrims' rests owned by the Government and Sinhalese organizations like Colombo Young Men's Buddhist Association and hotels which rent out rooms but Hindus will not dare to go there. The flow of Hindus from other lands has also naturally dwindled, especially after Dhanapathi, a Hindu pilgrim from India, was hacked to death at a barber salon in Kataragama in 1983. Those Tamils who lived there and in the neighborhood of the holy village have fled from their homes. "There existed a Hindu village, Tanjai, about 10 miles off Kataragama, which had 2 temples and about 130 Tamil families, when I was young", reminisces 87-year old landed proprietor, Sinnadurai Pasupati, of Tissamaharama in the South. "This village has disappeared." Of the thousands who flocked for the 15-day annual festival held this July, a handful were Hindus. Marutakali Tangamma, a laborer from Vavuniya in the North, said that when she boarded the C.T.B. bus to attend the festival, the fear of death and despair was lurking in her. "By Murugan's Grace, I arrived safe." S. Saravanamuttu of Vishwa Hindu Parishad, Sri Lanka, appealed in his Presidential message: "It is the sacred duty of all Hindus to help the Swami of the Theivanai Amman Trust in their efforts to consolidate and strengthen the position of the Hindus in Kataragama. They are struggling against many difficulties and are trying their best to overcome many obstacles. Moral support alone is not sufficient. Financial assistance and aid in other forms should be made available to them. Prominent Hindus should place at their disposal their talents and skills. Wealthy Hindus should support them liberally. Hindu societies and organizations must come forward to encourage them."